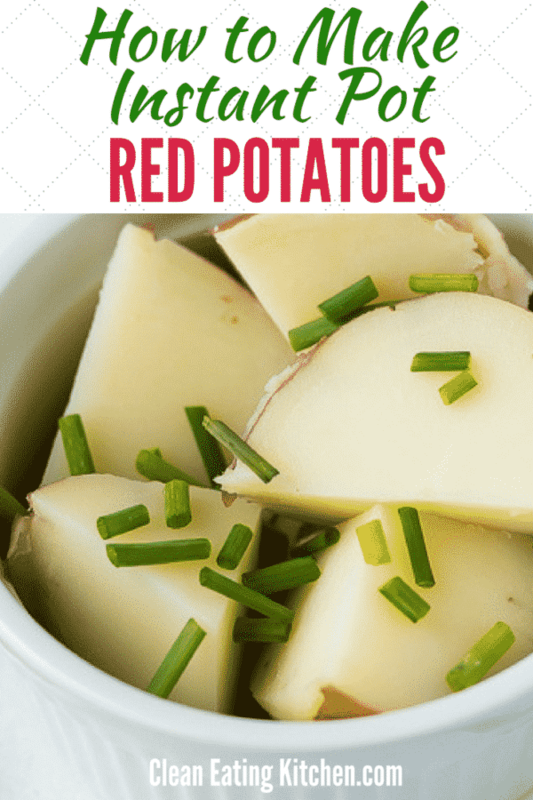 In only 10 minutes cooking time, the Instant Pot makes creamy whole red potatoes with the perfect texture. Serve them as an easy, healthy side dish! You might remember I made Sweet Potato Mash in the Instant Pot pressure cooker last Thanksgiving, and that recipe was such a hit. Then, my 3-ingredient cabbage recipe video went viral on FB. These two recipes are so simple that I almost didn’t post them. But, I think I finally got it through my thick skull that you like no-fuss, no-muss, easy recipes as much as I do, ha! Now let’s get into the actual process of cooking potatoes. While I used to cook my potatoes in the oven for almost an hour, I get the same result with only 10 minutes cooking time in the Instant Pot. What a huge difference in time and efficiency! Honestly, I will never cook a potato in the oven again. The first step is to wash the potatoes and give them a pat dry with a clean towel. You’ll be able to cook about 4 small red potatoes in a 3-quarter Instant Pot pressure cooker or 6-7 small red potatoes at a time in a 6-quart Instant Pot pressure cooker. Next, add one cup of water to the base of your pressure cooker, place the stainless steel trivet in the bottom, and add the potatoes to the base on top of the trivet. Lock on the lid and set the timer to 10 minutes. Use either the natural-release or quick-release before opening. Get my FREE Instant Pot Cheat Sheet when you join my e-mail list HERE! Are red potatoes healthier than gold potatoes? Maybe, because the red skin likely has more antioxidants than plain skin. I couldn’t find any research about this though. Aren’t potatoes unhealthy? Fried potatoes are not healthy, but whole cooked potatoes in the context of an overall balanced diet should not be consider unhealthy. What do red potatoes taste like? They have a creamy texture, maybe because they’re starch level is a bit lower than that of a russet potato. I like to serve them with grass-fed ghee or coconut oil. Aren’t potatoes in the nightshade family and therefore should be avoided? Yes, white potatoes are indeed a member of the nightshade family. Some people are sensitive to nightshades, but it’s dependent on each individual person. Are potatoes healthy or not healthy? You’re not afraid of eating potatoes are you? The reason I ask is because there has been quite a change within the health community about the health status of potatoes. 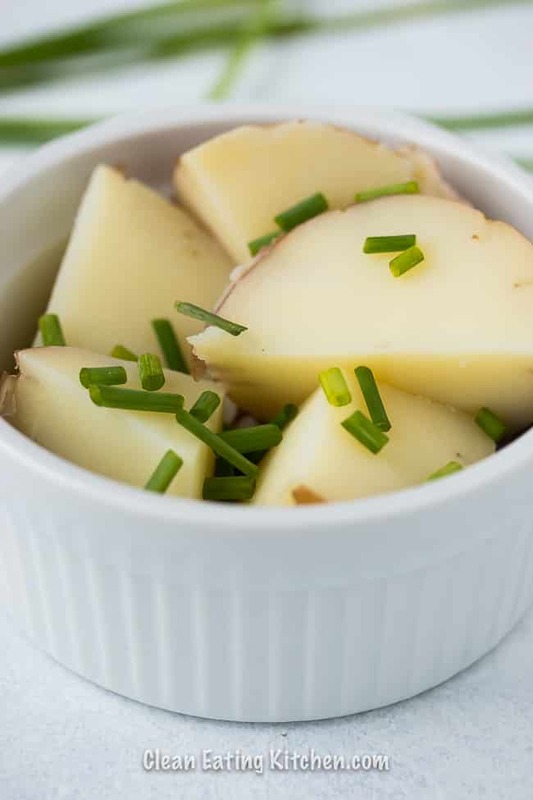 The strict paleo folks once argued that white potatoes are off-limits since they didn’t proliferate until agriculture got underway, and some other people like to say that potatoes are too high in carbohydrates to be considered nutritious. I think potatoes are amazing and I include them as part of my real food, clean eating diet (read my definition of clean eating). 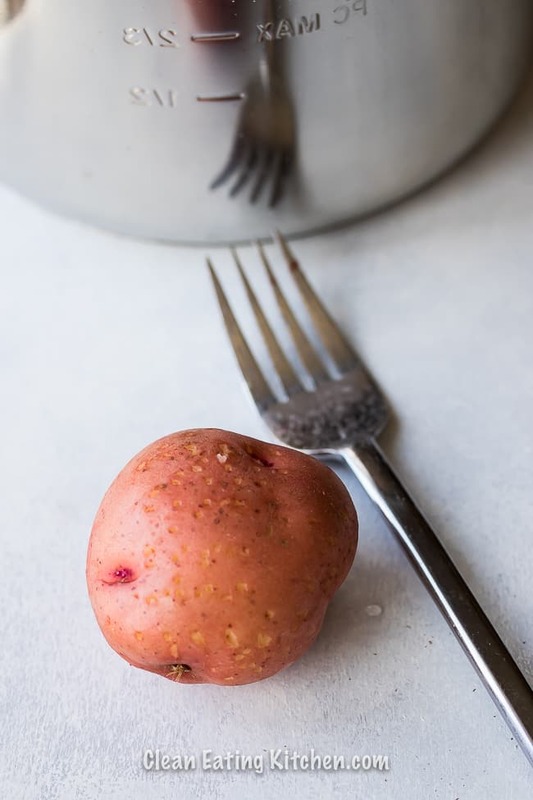 In fact, for my friends who suffer from insomnia or difficulty sleeping through the night, it’s been proposed that consuming one serving of starchy food like potatoes (red, white, or sweet potatoes) or rice at dinnertime can help maintain a steady blood sugar level. The idea is that by topping off the liver glycogen levels with a reasonable amount of starch, the body has a source of fuel and it’s less likely you’ll wake up in the middle of the night. In this way, starch balances hormones! As I mentioned, the texture is absolutely perfect! Serve your pressure cooker potatoes however you like: plain, with butter or ghee, with sour cream, or with coconut yogurt and a sprinkle of fresh chives. Delicious!!! How do you cook small potatoes in a pressure cooker? Just place them on the trivet with a cup of water and set the time to 10 minutes at high pressure. You don’t need to prick small potatoes before cooking them in the Instant Pot. How many red potatoes are in a pound? There are 7 to 9 red potatoes in a pound. How many potatoes in 2 pounds? There are 14-19 red potatoes in 2 pounds. How long does it take to cook in a pressure cooker? It takes 10 minutes at high pressure to cook red potatoes in a pressure cooker. 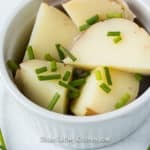 Do I have to prick the potatoes before cooking them in the Instant Pot? I used to think so, but then a few people informed me that you do not need to prick the potatoes before cooking them. 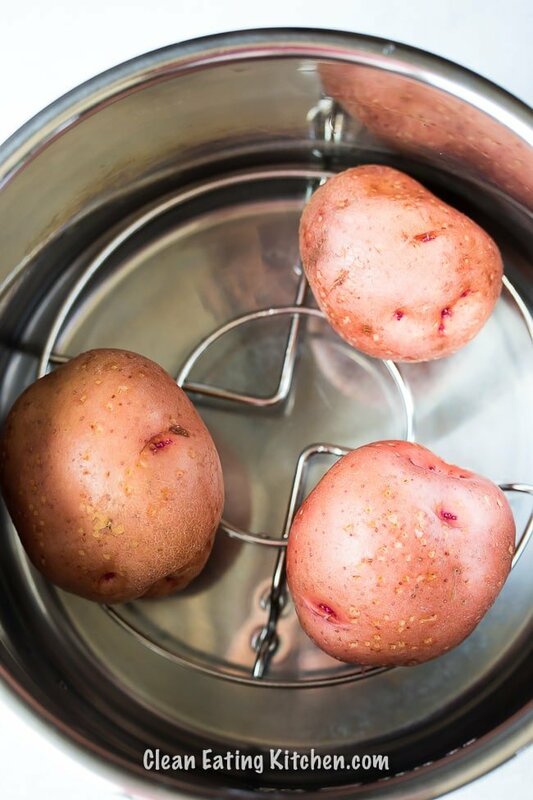 Here’s how to cook whole red potatoes in the pressure cooker. The first step is to wash the potatoes and give them a pat dry with a clean towel. 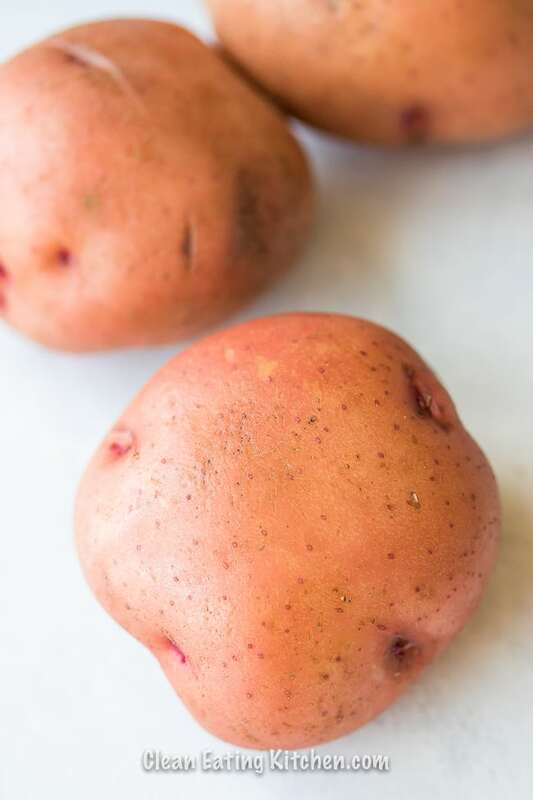 You’ll be able to cook about 4 small red potatoes in a 3-quarter Instant Pot pressure cooker or 6-7 small red potatoes at a time in a 6-quart Instant Pot. Also, be sure to allow an additional 10 minutes for the pot to come up to pressure. I make this recipe almost every day! Hi Carrie, you’ve got great tips and tricks in cooking! I’m learning. What setting do you use on the instant pot? High pressure? Low pressure? Steam? I had 8 small red potatoes, and used HIGH pressure, needed 15 minutes for them to be soft in the middle. And they were goooooood! My IP only has one setting for pressure, so high pressure! I’m glad you liked how the potatoes turned out! I love potatoes but to have them in less than 15 minutes is a game changer. Such a great recipe! Loved it! Thanks for this delicious recipe, will be making again and again! We love potatoes! And using our Instant Pot to cook them 🙂 So easy! love how easy these look! and there’s nothing better than a well cooked simple potato! Yum!! I’ve been looking for more vegetarian Instant Pot recipes so I’m glad to have found this one! Thank you!